At the invitation of President Jakaya Kikwete of the United Republic of Tanzania, Vice Chairman Zhang Ping of the Standing Committee of the National People’s Congress will travel to Dar es Salaam on November 5 as Special Envoy of President Xi Jinping for the inauguration ceremony of President-elect John Magufuli. Q: A US State Department official said that the United States welcomes the meetings of the leaders of China, Japan and the ROK in Seoul, supports their efforts to improve relations among the three countries and believes that strong and constructive relations between China, Japan and the ROK support regional peace and prosperity and serve the interests of the US and the region. What is your comment? A: On November 1, the sixth trilateral leaders’ meeting of China, Japan and the ROK was held in Seoul, the ROK, during which the three leaders had an in-depth exchange of views on trilateral cooperation and international and regional issues of common interest. The three leaders reaffirmed that they set great score by trilateral cooperation, and will properly deal with relevant issues in the spirit of facing the history squarely and looking forward to the future, deepen cooperation in the fields of politics, trade and finance, sustainable development and people-to-people exchanges, jointly make contributions to economic integration in the region, and move towards the East Asia Economic Community hand in hand so as to contribute more to the renewal of Asia and world peace and development. The resumption of the trilateral leaders’ meeting of China, Japan and the ROK after a three-year suspension is of great significance. We hope that trilateral cooperation will move ahead without disturbance. We stand ready to work with the ROK side and the Japanese side to take this meeting as a new starting point, meet each other halfway with the larger picture in mind, and put trilateral cooperation on the track of sound, stable and sustainable development. Q: Reports said that China raised the figures for coal consumption in previous years ahead of the Climate Change Conference in Paris. Can you confirm that? A: I would like to refer you to competent authorities. As for the issue of climate change, during French President Hollande’s stay in China, the two leaders had an in-depth exchange of views on the issue of climate change, reached a series of consensus and issued the Joint Statement of Heads of State of China and France on Climate Change which is worth your thorough reading. The joint statement demonstrated the resolution of the two sides to tackle climate change, passed on a positive signal that China and France will work in concert to contribute positive energy to the multilateral climate change process and ensure the Climate Change Conference in Paris a success. The Chinese side will continue to play a positive and constructive role in the negotiations of a Paris agreement, and work with relevant parties including France to move the Paris conference towards a comprehensive and balanced result and contribute a truly effective solution to the world campaign against climate change following the principles of common but differentiated responsibilities, equality and respective capabilities. Q: On November 2, the Nepali government used force to disperse Madhesi protesters gathered at the Nepal-India border. The police operation has injured 12 protesters and killed an Indian citizen. What is China’s comment? A: The Chinese side follows closely the situation in Nepal. It is expected that the Nepali government and all relevant parties can bear in mind the unity of the state, the stability of the society and the fundamental interests of the people, work in concert to resolve disputes independently through dialogues and consultations, stabilize the situation as soon as possible, and make joint efforts for the post-quake reconstruction and long-term development of Nepal. Q: Leaders across the Taiwan Straits will meet in Singapore on November 7. Why did they choose to meet in Singapore? A: Zhang Zhijun, head of the Taiwan Work Office of the CPC Central Committee and the Taiwan Affairs Office of the State Council has given a press interview on the meeting between leaders across the Taiwan Straits scheduled for November 7 in Singapore. I would like to refer you to the Taiwan Affairs Office of the State Council for the specifics. 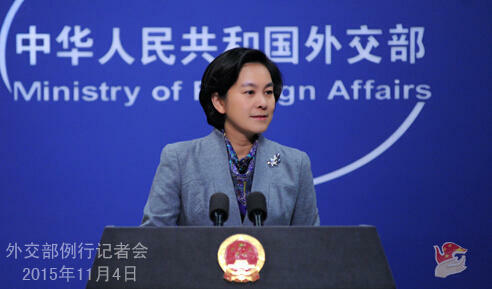 Q: It is reported that the Foreign Ministry of China has appointed a new Special Envoy on Afghan Affairs. Can you confirm that? A: The Chinese side has been playing a positive role in pushing forward the peace and reconciliation process in Afghanistan and attaches great importance to Afghanistan-related international cooperation. In July, 2014, the Foreign Ministry of China set up the post of the Special Envoy on Afghan Affairs. This September, former Ambassador to Afghanistan Deng Xijun was named as the Special Envoy on Afghan Affairs. Special Envoy Deng is a veteran diplomat with rich experience of Afghan affairs. It is believed that he will fully fulfill his duties. He will do his job in line with the actual needs. Q: In recent years, China has been playing an active role on the Afghan issue and facilitated talks between Afghan Taliban and the Afghan government. Against the backdrop of Taliban Chief Mullah Omar passing away and the American troops extending their stay, what kind of role is China looking to play? A: Chinese Vice President Li Yuanchao visited Afghanistan yesterday. He met with Afghan President Mohammad Ashraf Ghani in Kabul and attended the reception marking the 60th anniversaty of the establishment of diplomatic relations between China and Afghanistan with President Ghani. During the visit, both sides had an in-depth exchange of views on deepening China-Afghanistan traditional friendship and issues of common interest. Afghanistan is at a crucial stage of political and security transition. China supports the “Afghan-led, Afghan-owned” reconciliation process, commends and supports efforts by the Afghan government to this end. The Chinese side will continue to play a constructive role in the Afghan peace and reconciliation process in line with the requests and wishes of the Afghan side. Q: The Democratic Progressive Party in Taiwan said today that the mainland is seeking to influence the outcome of the election in Taiwan by holding the meeting of leaders acorss the Straits. What is your reaction to that? A: I would like to refer you to the Taiwan Affairs Office of the State Council for specifics concerning the meeting of leaders across the Taiwan Straits. I want to point out that peaceful development of cross-Straits relations serves the interests of the two sides across the Straits as well as peace and stability of the region and world at large.